When did Africa become a thing? According to Esquire, the Toto song “Africa” is a postmodern thing. Unlike other similarly delightful synth-rock tracks from the era such, Toto’s “Africa” seems like an old hurt that just won’t quit. From beloved TV shows such as Master of None and Stranger Things, to a Twitter bot that tweets its lyrics from the song several times a day, the song seems to have captivated a new generation. Just this March, a video uploaded by an ingenious idiot who hacked his Volvo 240’s door chime to play the song was viewed over 3.5 million times. Not that I’m complaining. The song is on my iPhone playlist. But I’m an old guy. What’s their excuse? It shows every woman who has ever served on the U.S. Supreme Court. Seated from left are Sandra Day O’Connor and Ruth Bader Ginsburg. Standing are Sonia Sotomayor and Elana Kagan. The first Supreme Court was named in September 1789. Since that time there have 112 Supreme Court Justices in American history. In all of American history, these are the only women who have had the title of Supreme Court justice. All four are alive. O’Connor retired 2006. Ginsburg, Sotomayor and Kagan are currently on the court. This is an amazing portrait, because it makes you reflect on the history of this country and our shortcomings. Just if you go by population distribution, in a country that believed in equality, 57 women should have served on the Supreme Court by now. How much would have history changed if that were the case? But women weren’t allowed the right to vote until 1920. Pure sexism. A patriarchal mindset kept women and minorities off the court for hundreds of years. Of the 112 justices, only two have been African American: Thurgood Marshall and Clarence Thomas. Only one of them is alive. Population distribution over history should have made that number closer to 15. But the country was founded on the enslavement of Africans that only ended with the Civil War. And the post Civil War treatment of blacks was dominated by segregation and Jim Crow laws. Pure racism. You can’t tell me that in all of American history, there weren’t 57 women or 15 African Americans who would have made excellent Supreme Court justices. But here I am. 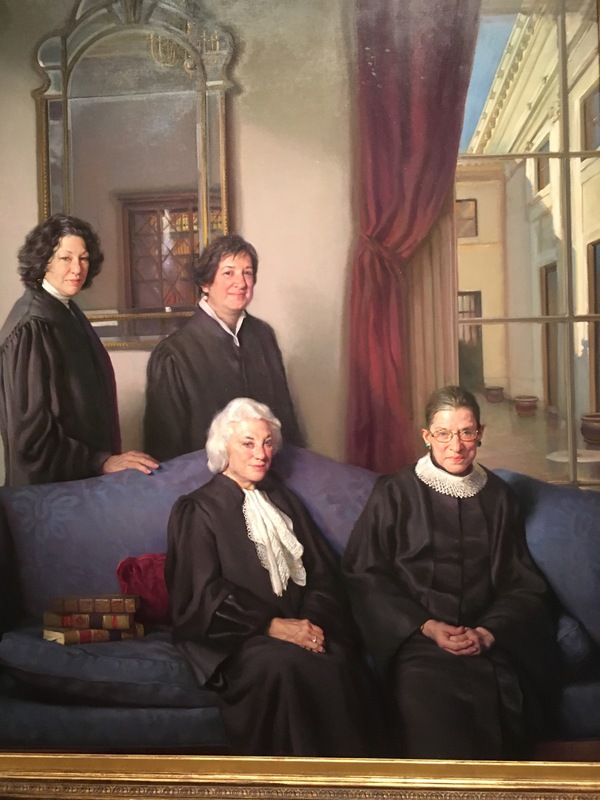 Standing in the National Portrait gallery, reflecting on a painting of every woman who has ever served on the U.S. Supreme Court, realizing that every one of them is still alive and seeing the empty space in the portrait where other women should have been.